The Victoria Centre has changed quite dramatically over the last few months with the refurbishment and regeneration of the area around the old Clock Tower. What used to be Vision express, Farmfoods and a number of less glamorous retail units have been replaced by many impressive eateries. Thaikun has moved in upstairs directly above the entrance to the new Intu Victoria Centre in what appears to be a promising development of the centre as somewhere for more than just a visit to the shops. We previously visited for their opening VIP party and were impressed with an ambience that brings the hustle, bustle and street food culture to Nottingham. So much so we were more than happy to accept an invite to return for a review. Thaikun has the atmosphere and decor of Khaosan Road in Bangkok, a kind of mixture of lively and yet laid back, and perhaps appealing to a crowd for whom the meal will feature as part of a longer night out or day than those who are simply just going out for a meal. Bringing something very different to the Victoria centre, Thaikun offers adventurous diners the opportunity to sample something a little more unique. Whether it's a meal with friends before a night on the town or simply refuelling ready to hit yet more shops. Mark: "This is a combo platter with four rather tasty morsels for us to try, Salt and Pepper squid, fish cakes, Chicken spring rolls, Honey pork. 2 of these dishes we tasted previously – chicken Spring rolls and the honey pork. Just as tasty and Moorish as they were the first time I tried them! You could serve them in a big bag like popcorn at the cinema for me. The fish cakes were unlike what I had envisioned – small and almost balls, red in colour with a nice spicy taste with herbs. At a risk of being a bit repetitive but they were really tasty and quite Moorish! Full of flavor these were unlike any fish cakes I have had before. Very tasty! Next on the platter is the salt and pepper squid, we all know the bad Calamari strips you can get that have the taste and consistency of an elastic band. These were nothing like that; tender and subtle flavor moist and tasty and if you are the one person who hasn’t had squid before then here is a good place to see what they are like. All this was served on a raised up wooden board presumably because tables in restaurants’ are not the most spacious of places so in that sense it works as a unique and practical way to serve multiple starters." For me the highlight of the starter was the squid. Beautifully soft so it almost melted in your mouth as you ate. Lovely with a dip of the chili sauce accompaniment. Liam "The rolls could possibly be enough for two people. The mint is the first flavour which hits you, leaving a very fresh impression on your palate. There's lots going on with plenty of shredded carrot, lettuce, coriander and basil to hit your senses, I have also tried the Sweet Corn Cakes which provide a lighter starter if that is your preference." Liam "Our mains followed on swiftly from the starters. 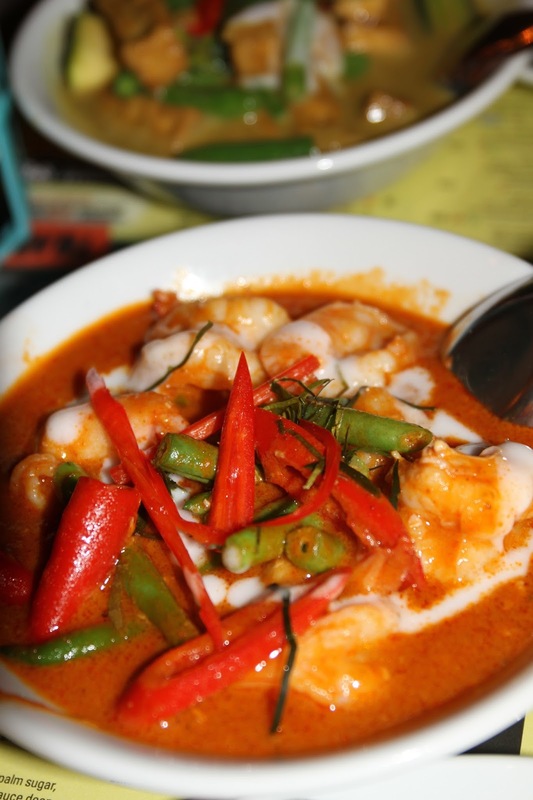 For those of you who have eaten Thai before, you are no doubt aware that a Thai Curry uses coconut milk as the main constituent of the sauce which gives it more of a soup consistency than an Indian Curry. The Thais also like their chillies, using them not just as a spice but serving them sliced in the curry itself. All their curries come with Jasmine rice as standard and the dish did not disappoint. The blend of heat, flavour and a hint of sweetness is what makes a Thai curry the dish it is, all of which were present here. If anything, it perhaps could have been just a touch hotter with the spice, although I would urge caution with making any such request as the Thais tend to prepare their food much hotter and spicier and probably temper it a little to the tastes of Europeans like ourselves. If you ask for it a little hotter, you may end up being surprised by the results"
Mark (who's not usually someone to go spicy opted for the Panang Goong which didn't have a chili scale showing hotness on the menu. My choice was the sea bass fillet. This was beautifully cooked in a banana leaf. Having never actually had anything cooked this way previously I had to ask the question "Can you eat the banana leaf?". I little bit of running round by the waitress and we now both know the leaf isn't for eating. The sea bass, whilst cooked over charcoal was so soft it could almost have been steamed. I loved the additional elements of the lime leaves and galangal at first but over time the galangal did get to be rather harsh on the palate. It may have been that it's something I'm not used to but it does have quite an overpowering element to me. I complimented the sea bass with a bowl of coconut rice. I was rather surprised that at such a price the sea bass doesn't come with a portion of rice as fish and a small amount of salad is not going to satisfy many people. I'd certainly like to see it offered with rice as standard. When you think of pancakes you generally think of Shrove Tuesday with nice big golden round discs around 5 mm thick drizzled with whatever your topping of choice is. The pancakes at Thaikun certainly didn't quite meet up to our usual expectation in a very different way. Mark "So what do you get when ordering the Pancake Sankaya (£5.95)? Well for a start its green, I mean really green! And the custard is green as well! Normally they come with vanilla ice cream however they had run out as a very apologetic member of staff advised so what would I like instead? Well coconut of course!- the pancake was on one side with ice-cream on a slice of orange – a very attractive looking dish. In terms of taste it was quite different to anything I have had before the pancake looked half cooked but that is judging by how we do pancakes! So it was almost certainly cooked correctly and the custard was a good custard consistency. As for taste it was very subtle to me and difficult to determine any particular flavors. On its own I am not sure I would have this again as the flavors were not that bold, unlike the other dishes of the night. The coconut ice-cream in contrast was full of flavor and tasty, not to sweet but clearly made with shredded coconut and on balance I think worked better with the pancakes than the vanilla would have. I did grab a taste of the mango sorbet that my friend had with his desert, this was Really good! A strong flavor that cut the palate like a sharp knife, this was tangy and refreshing I would almost advise having one between courses to cleanse your taste buds in preparation for the next course!" As a contrast I opted for the Khao Niew Moon Pancake (£5.95), a Pandan pancake made using a south-east Asian leaf which sends the pancakes green due to it's chlorophyll content. The pandan leaf adds flavouring although the pancake itself had the consistency of a fine sheet of cake icing. The pancake wrapped a portion of sticky rice which was flanked by a beautifully refreshing mango sorbet which to me worked will to add extra flavour to the pancake. Without the mango sorbet the dish would have been a little on the bland side but it was subsequently transformed as a result into a very nice dessert. One of the best things we noted of Thaikun were the staff. Extremely friendly and seemingly forever smiling without it seeming forced. It seems that Thaikun appears a nice place to work. The staff were attentive and informative as well as being a real pleasure to deal with.